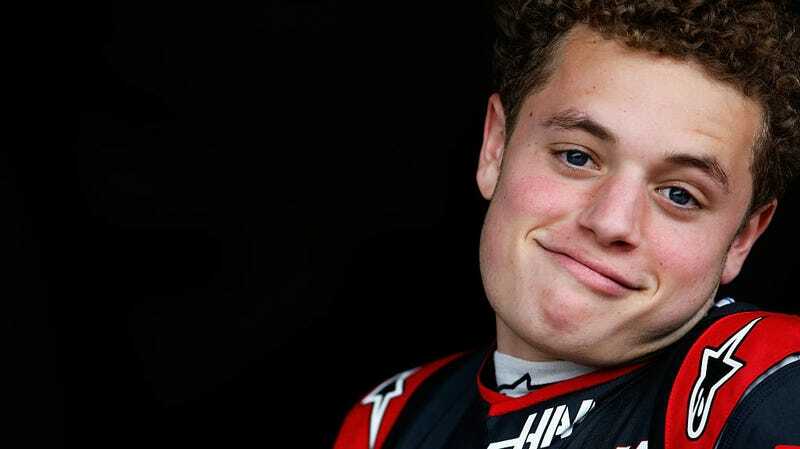 Despite the team boss saying political ads weren’t allowed, Formula 2 driver Santino Ferrucci—who drew near-universal ire this weekend for running into his teammate after the race ended and holding a phone while driving from the support paddock to pit lane—and his family “insisted” on trying to run President Trump’s “Make America Great Again” slogan on his race car. The request was denied by the sport’s governing body, the FIA. Ferrucci apparently wanted to run the decal on his car at the Silverstone weekend alongside Formula One, where all of that happened. “Insistent” was how Ferrucci’s team principal at Trident Motorsport, Maurizio Salvadori, described the family’s request to use the slogan on the car. Neither Salvadori nor the letter from the FIA denying the request said how much of the car’s scheme the slogan would take up—whether it was a full-on Make America Great Again car or just a small decal—but Salvadori told Jalopnik in an emailed statement that he tried to tell the family it wouldn’t work. “Everyone in the motorsport field is aware that it is forbidden to affix to their automobile advertising that is political in nature,” Salvadori said. “When I was approached with this request on behalf of the Ferrucci family, I tried to explain the impossibility to adhere to this demand. The letter from the FIA popped up on Twitter Monday, which said the slogan wasn’t allowed according to the Article 10.6.2 in the FIA sporting code. The post has since been deleted. The rule says, verbatim, that competitors in international competitions “are not allowed to affix to their Automobiles advertising that is political or religious in nature or that is prejudicial to the interests of the FIA.” Neither the letter nor Salvadori said what the Ferrucci family’s motives behind running the slogan were, or if they planned to run it for free. But Salvadori wasn’t as concerned with the slogan as he was with the Ferrucci family’s apparent behavior. “The fact that this letter is circulating today on social media seems to me like a clumsy attempt to take the attention away from the principal problem that is, Santino’s and his father’s behavior on and outside the track in these last weekend races,” Salvadori said. F2 posted a penalties report on Ferrucci on Sunday, saying he was “in breach of multiple regulations throughout the race.” Race stewards ruled that Ferrucci deliberately hit teammate Arjun Maini on the cool-down lap of a race, forced Maini off track when he tried to make a pass, and that Ferrucci drove from the paddock to pit lane with only one glove on, holding a phone in his hand. F2 fined Ferrucci about $80,000, and said in the report that he didn’t attend the hearings for his penalties. Trident tweeted the penalties report, saying the team “intends to show their solidarity and support” to Maini and his family “for the unsportsmanlike and above all uncivilized behavior that he was forced to endure not only during this last weekend by Santino Ferrucci and father, who accompanied him.” The team then posted about lawyers reviewing contractual implications. Trident didn’t expand on the mention of Ferruci and his father’s “uncivilized behavior.” Jalopnik has asked Salvadori and representatives for Maini about that, and will update this story if we hear back. Ferrucci said it wouldn’t happen again, and apologized to his team, sponsors, drivers, fans, friends, family and the racing organizations.